This morning your students are waking up to a grey and windy – and much colder – day. The five day forecast shows temperatures a lot cooler than we’ve had. Though the fall leaves are right now at their most beautiful, this is the first extended cold snap. Other than having some wind from Hurricane Sandy, all’s quiet on the Southern front. Even the wind we are projected to have is not terrible – steady winds around 19 mph, occasional gusts up to 40. It is nothing like the Mid-Atlantic and Northeast are getting. Winston-Salem pretty much misses the impact zone, so you needn’t worry about your students. 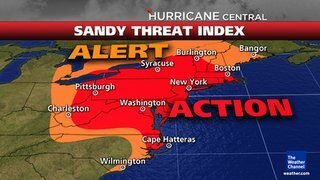 A lot of our students come from areas where Hurricane Sandy will impact: Virginia and DC and Maryland, Pennsylvania, New Jersey and New York, all the way up to Boston. If your students have been paying attention to the news, they might be worried about you, your house, how you are faring. So as long as your cell phones work, call or text them later today to let them know you are alright. It will make them feel better to hear from you. And for everyone in Sandy’s path, we are sending our thoughts and prayers your way: that the impact is minimal, and that all of you fare well in the storm. Be safe.